Most small houses will have a run, either built on or available as an optional extra from the manufacturer. It is a good idea to buy the house and run from the same manufacturer because they will fit easily together. Some manufacturers have interlocking runs so that you can extend the protected area as required. Alternatively, buy a free-standing one that can be dismantled as needed. You can also make your own or provide a fenced off garden area. Some houses have runs which extend underneath. This maximizes the use of space so that the hens have more room to range. If part of the run is covered, it provides protection for the birds to go when it is raining or very sunny, so that they still have the benefit of being outside. It is also useful to be able to put the feeder and drinker under cover. 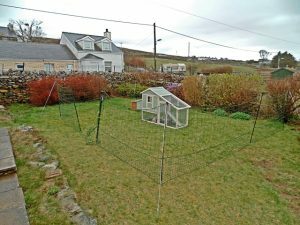 Perhaps the most important thing about the hens’ ranging area is that it is changed regularly. If chickens are left on the same ground all the time, it becomes denuded of grass, and parasites and disease organisms build up. The ground literally becomes ‘sick’ and the birds succumb accordingly. The simplest setup is to have a movable house and run which is moved regularly to fresh grass. Move it as soon as the grass shows signs of wear. Alternatively, have a house with two runs, letting the hens use one run at a time, so that as one is in use, the other run is ‘resting’. Some houses have a pop-hole at each end, which is a useful feature for controlling access to alternate runs. 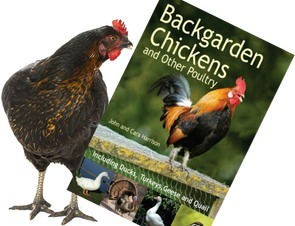 In winter, it may be more appropriate to have the chickens in a house and run on a concrete base which can be hosed down easily, while allowing the birds access to a sanded area for scratching. A really thick layer of hard, coarse wood chips makes an excellent winter run base when the grass has stopped growing. It also absorbs droppings and can be raked over and added to as required. Remember that wood chips are not the same as shavings or shredded prunings which are softer. Shavings are fine inside but not outside. Wood chippings are hard and allow rainwater to drain through leaving the surface dry. A movable house and run is very useful if you want the birds to do your vegetable bed clearing in winter. They scratch up weeds and clear the soil of slugs and other pests. As one area is cleared, move the unit on to the next one. By the time spring arrives, the ground is ready for a light forking and planting.